Ep. 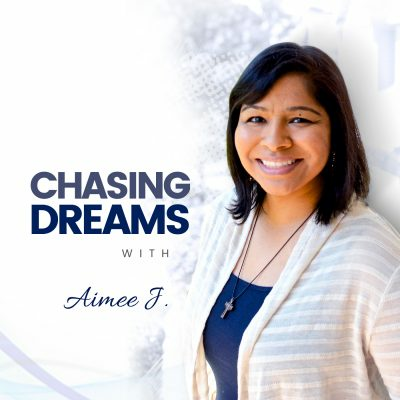 12: Alex Barker – Being a Life A Chemist | Aimee J.
Chasing dreams is not an easy thing to do. There will be setbacks. There will be discouragement. There will be failure. But it’s what you do in those times that determines if you will be an overall success or not. 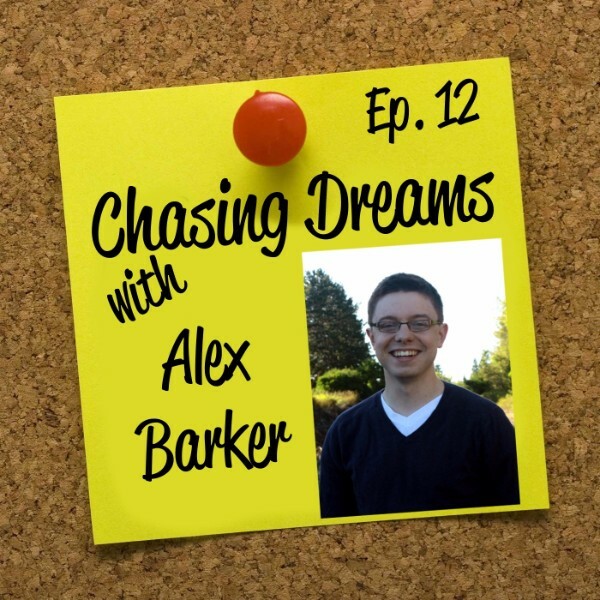 Today’s guest on Chasing Dreams is Alex Barker. Alex is the host of “The 66 Day Experiment” and a very busy guy. He’s a pharmacist by day and entrepreneur every morning as he takes 2 hours of every day to work on his podcast, his writing, and lots of other stuff. In today’s candid chat with Aimee J., Alex shares his journey, lessons learned, and tons of other great stuff you won’t want to miss. So grab a drink and some note paper so you can jot down the inspirations that hit you as you listen to this episode. It’s not about the destination, it’s about the journey. How is your journey going? A habit of sending Video emails to people he appreciates or wants to connect with. Alex and Aimee met at Podcast Movement 2015 and they hit it off immediately. Aimee knew right away that she needed to have Alex on the Chasing Dreams podcast. But something that sealed the deal for Aimee was that Alex sent her an email with this simple text in the subject line, “I Made You A Video.” The body of the email included a link to the video. Aimee couldn’t wait to watch the video. Simple, but very effective. Alex learned to do that from someone who once sent HIM a video email and he’s been doing it regularly ever since. He finds that it makes him stand out and gives him a touch point with people in a way that they’ll never forget. Aimee J. is proof of that. Hear other great tips like this from Alex as you listen. A passive income stream was the wrong goal to be chasing, or at least he was chasing it at the wrong time. When Alex Barker first started trying to “make money online” he was learning a lot from the podcasts he was listening to. Pat Flynn and many others touted the “passive income” idea and Alex bought into it. He tried everything: ebooks, Udemy courses, autoresponders, you name it. What he discovered was not that passive income was a bad idea or was wrong, but that he was shooting for something that was probably more in his future than in his present. His main goal in the present was to earn extra income as fast as possible to pay off personal debt and give his family a better lifestyle. So he switched his focus and changed his actions… which is not an easy thing to do. 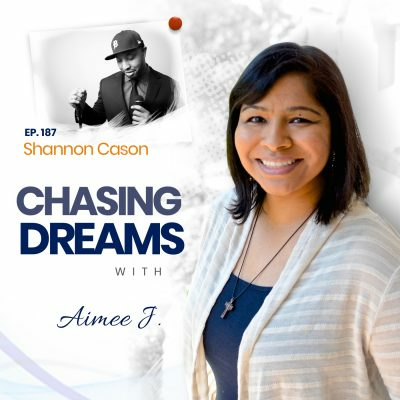 You can hear what he did instead, and how it’s going for him on this episode of Chasing Dreams, with Aimee J.
It’s not always about the destination, it’s about the journey. Alex Barker’s path toward entrepreneurship didn’t work out the way he thought it would. But that hasn’t stopped him… and THAT is KEY. Many people don’t get to the destination they assumed they were headed toward or don’t get there as quickly as they thought, and give up on it. But Alex kept going. He flexed, he pivoted, he reassessed when necessary, and he has continued pursuing his dreams even as the dreams themselves have morphed into something different. That way he’s been able to enjoy the journey every step, even the hard and disappointing ones. Alex’s journey and his perspective on it are a refreshing encouragement in the hard pushing entrepreneurial world we live in. You’ll be encouraged by his story as he shares it with Aimee J. in this episode. Resistance is real and it most often comes from inside you. There are moments in every Dream Chaser’s life when your own heart and mind seem to resist the goals and dreams you’ve set before you. It could be as simple as the urge to stay in bed for another hour. It could be as serious as wanting to give up altogether when you hit a significant challenge or roadblock. Alex Barker has a story that’s filled with moments of resistance, and his belief is that the things that makes the difference in those moments are the habits you’ve built, good or bad. Take a half hour out of your day to hear how Alex deals with the resistance in his own soul, and how he pushes forward consistently in spite of it. You’ll love his perspective. [0:49] Introducing Alex Barker – life Alchemist. [3:06] Alex’s explanation of a video email he sent to Aimee J. [4:36] How Alex is able to wear so many hats, and why he’s doing it. [7:50] The beginning of “Making money online” in Alex’s story. [8:50] How Alex discovered that the journey he was on was all wrong. [11:21] It can be easy to get lost in the cause… and how and why Alex reevaluated. [15:06] It’s not always a destination, it’s about the journey. [16:05] Even as we fight for freedom, we’ll hit resistance of various sorts. [18:59] Resistance and the help of coaches, masterminds, and accountability. [23:03] How Alex deals with the temptation to take things off his plate. [25:08] The Rapid Fire game with Alex. [27:24] What happened to Alex in the game? [29:53] An inspiring quote Alex loves and the story of Thomas Edison and the development of the light bulb. A back and forth response game based on the category chosen. The first to pause too long or give a patently false answer is the loser. Who’s going to win it? http://www.66DayExperiment.com – Alex’s website. Go to get your free course! What if you had a personal board of directors? How would that benefit you?